I work for Natalie Imhoff of The Bridal Solution, llc. in Jefferson City, Missouri, and I have provided day of coordination assistance on multiple weddings which are showcased on The Bridal Solution's website. As a member of the Student Union Programming Board, I serve on the Marketing Team. I am responsible for creating media to draw attendees to various events. I have received many comment cards and online reviews as a Front Desk Agent at both the Comfort Suites and the Holiday Inn. As a Sales, Marketing, & Event Coordinator at the Hilton Garden Inn Columbia, I have prepared numerous flyers and custom graphics for event marketing and company use. For my final project as a Senior in the Event and Conference track of the Hospitality Management program, I planned an event with a small group of my fellow classmates. Our event was a Career Conference for science majors. The purpose of the event was to promote networking within the science community on campus so the students could build relationships with the companies that will someday employ them. My main contribution to our special event was negotiating with caterers, deciding on a menu, sending RFPs, finalizing details for Banquet Event Orders, and supervising & coordinating our VIP luncheon from set-up to tear down. 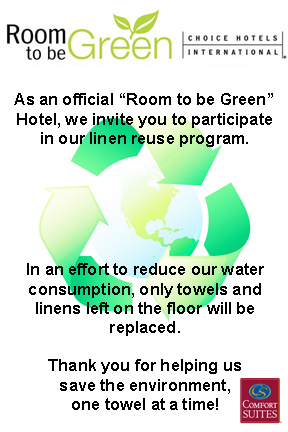 I created this piece to be placed in all guest rooms at the Comfort Suites to explain Choice Hotels' "Room to be Green" Program to guests.